The James Burn USA EC-14 wire closer is the least expensive electric closer on the market today. This foot pedal operated wire binding machine is affordable for everyone and is the perfect choice for your most important wire closing production work. The EC-14 can handle wire sizes from 3/16″ to 1-1/4″ of up to 250 pages and binding edges up to 14″ length, so it’s great for both short and long books. This easily adjustable machine allows for perfectly closed wire with every use. This wire cutter is engineered for operator safety because the operator must use two hands to activate the electric closer. The EC-14 can be used alongside all full-featured wire binding machines and modular punches. If you do not have a lot space in your work area this machine is a good choice because it is very compact and can easily fit on most desktops. The all metal construction of this machine makes its durable so you will be able to use this machine on a regular basis without any problems making it a great machine for any office environment. If you have any questions or are interested in purchasing the EC-14 Wire Closer, visit us at SpiralBinding.com. 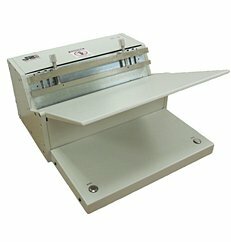 We have great pricing on a full line of Desk Top Punch and Bind Equipment. Call us at 1-800-631-3572 for more information!